Add modular outputs to any Reliable Controls® MACH-ProCom/Sys or MACH-ProWebCom/Sys controller with this flexible, general purpose output expansion module. 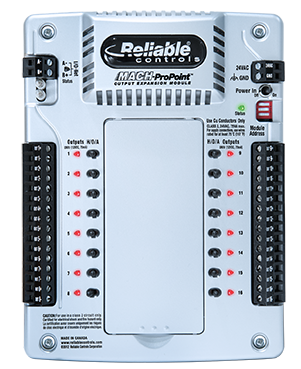 Each MACH-ProPoint Output expansion module features 16 universal outputs, and requires 24 VAC/VDC power. A maximum of 8 expansion modules can be connected to a single MACHProCom or MACH-ProWebCom controller. Up to 7 expansion modules can be added to a MACH-ProSys or MACH-ProWebSys controller. Each controller can logically support a maximum of 128 inputs and 128 outputs, and is also physically limited by the point count of the expansion modules connected. The expansion module is also available with optional HOA (Hand/Off/Auto) switches for convenient field override. 24 VDC ±10% 42W max.